Station Hollywood: Geeta Dutt – the legendary singer of bollywood. Geeta Dutt – the legendary singer of bollywood. Geeta Dutt was one of the legendary singers of bollywood films and she made a significant contribution in both hindi films songs and Bengali film songs. She married Guru Dutt and is associated with the legendary director and actor in the performance in his films. Her notable songs sung in Guru Dutt’s films include “waqt ne kiya kya haseen sitam” in the film Kagaz ka Phool, picturised on Wahida Rehman, “na jayo saiya” in Saheb bibi aur ghulam, picturised on Meena Kumari, etc. Besides she was even elegant in singing kirtans and folk songs including “jane kya tune kaha” from the film Pyasa, composed by SD Burman, which was the hindi versions of his own song “mono dilona badhu”. She was sublime in her huge of number of Bengali songs picturised on Suchitra Sen including “tumi je amar” from Ajoy Kar’s film Harano Sur, “ogo sundoro” from the film Indrani, opposite Uttamkumar. She had sung for tunes composed by Salil Chowdhury also when he was in IPTA including songs like “tomay dekhechi”. 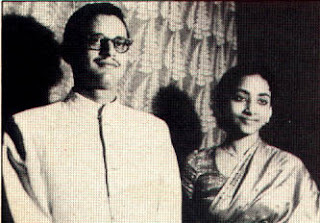 Geeta Dutt made significant contribution in songs composed by OP Nayyar, as her style of singing matched his style of composition very well. The notable songs include “mera naam chinchin chu”, songs in the film Mr Mrs 55, picturised on Madhubala, etc. After the death of Guru Dutt, she reduced her number of playbacks, but again made a comeback with the songs “meri jaan, tujhe jya na kahun”, “mera dil jo mera hota”, picturised on Tanuja from the film Anubhav, which was an offbeat film directed by Basu Bhattacharya where Sanjeev Kumar made a notable contribution. She had also sung in films of Raj Kapoor, including songs like “bolo shawaiwai”, from the film Jagte Raho, in 1956. Actually she was elegant in the contributions of Salil Choudhury, OP Nayyar, SD Burman, Hemant Kumar, etc., who had used her soft style of singing and aggressive style too. After Lata and Asha, she is the most respectable female singer who had graced bollywood films. Her songs should be restored and preserved for the new generation to know the art of traditional singing. 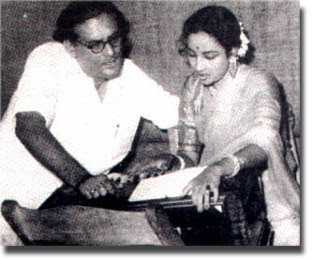 Geeta Dutt's song "bhawra bara nadan hai" composed by Hemant Kumar and picturised on Wahida Rehman was very sweet. Her bengali song "nishi raat banka chand" from Uttamkumar's film Prithibi Amare Chay was very famous. Geeta Dutt had specialised a typical style of singing which suited Suchitra Sen very well. Her songs with Rafi in the film Bombai ka babu, picturised on Suchitra Sen like "pa ma ga", "dekhne me bhola hai" were big hits. There is a song where Geeta Dutt sang just one line-the mammoth "hai aag hamare seene mein" from the movie Jis desh mein Ganga Behti hai.And hers is the sweetest voice.Try it. 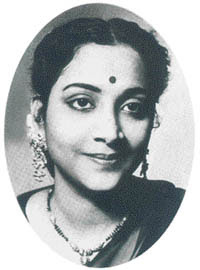 Geeta Dutt's successful bengali songs include "jheeri jheeri chaitali batashe", "sochimata go", "krishnanagar theke", "koto gaan haralaam", "ogo amar moner" etc. She was successful in her modern songs and film songs and prominent in Bollywood films after Lata in the 50s and 60s. And again, dekhne mein bhola hai is also an asha number. I feel hurt by attributing these ordinary numbers to Geeta Dutt. do you also allow downloads of rare geeta numbers? Akshay Khanna – the decent actor of bollywood. Mumtaz – the dancer of the swinging 60s. Arshad Warsi – the serio-comic hero of bollywood. Parveen Babi – the stylish actress of bollywood. Jaya Prada – the gifted dancer of bollywood. Shatrughun Sinha – the action king of bollywood. Katrina Kaif - the sweet actress of bollywood. Helen – the elegant dancer of bollywood. Tanuja – the charming actress of bollywood. Hemant Kumar – the man with the golden voice. Sunil Shetty – the action star of bollywood. Meenakshi – the elegant actress of bollywood. Amrish Puri – the indispensable actor bollywood. Tabu – the aggressive actress of bollywood. Sunil Dutt – the cultured actor of bollywood. Akshay Kumar – the all-in-one actor of bollywood. Nargis – the legendary actress of bollywood. Udit Narayan – the unique singer of bollywood. Lata’s combination with RD Burman. Rekha – the sweet actress of bollywood. Amir Khan – the decent actor of bollywood. Mala Sinha – the charming actress of bollywood. Nasiruddin Shah – the natural actor of bollywood. Smita Patil – the realistic actress of bollywood. Guru Dutt – the thoughtful actor of bollywood. Bipasha Basu – the daring actress of bollywood. Saif Ali Khan – the smart actor of bollywood. Nanda – the soft actress of bollywood. Nutan- the sophisticated actress of bollywood. Rajesh Khanna – the superstar of the 70s. Vinod Khanna – the powerful actor of bollywood. Sridevi – the impressive actress of bollywood.